You do not have to try and explain the hum and roar of a Chevy engine to a current GM-Chevy car owner. If you have not yet experienced what it is like to own a Chevy engine, we will introduce you to how easy it is to buy one for your car or truck. Our Chevrolet crate engines are easy to install and drop right in under your hood. Foreign racing engines and junkyard finds might require you to modify the engine brackets for an errorless fit. Our engines are drop in ready and offered at a low price. 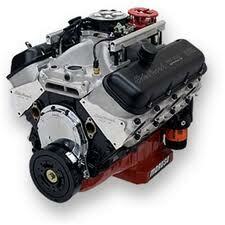 Many people are first introduced to the GM performance 350 small-block engine. This engine is most associated with the Chevrolet Camaro and the Nova in later years. If purchasing either of these cars is out of your budget, you can purchase the engine and drop it into the chassis of your choice to find out the real power that you get with our crate engines. The reason that the small-block 350 engine was produced for over 46 years is that the performance has never been matched by competing automakers. Chevy fans have known this secret for five decades. There are other choices apart from the small-block 350 to select whether you are building a hot rod or just fixing up a car on the weekends. Every engine that we sell comes with an extended warranty so you do not have to worry about quality issues. Here is a list of some of the engines in our inventory of crate engines by Chevy. This small sample of engines will introduce you to the types of Chevrolet engines that we carry. Every one of our engines is in pristine condition and ready for placement into your car, hot rod or truck. You do not have to be a vintage car owner or racing fanatic to appreciate what a crate Chevy engine can do for you in terms of speed and longevity. Apart from the condition and performance of our engines, what you get is an absolutely unmatched online price. You can get started with the order process in two ways. The first way is to contact our engine specialists through our quote form. You provide some basic information and we go to work checking our inventory levels and pricing. You can call our engine specialists by phone at (336) 355-5679. We will help you complete your purchase for our Chevrolet crate engines with out any hassles or issues that frequently happen with other engine dealers.